Raised Pond Kits - outdoor and garden aquariums. If you want a big, sturdy and attractive outdoor fish pond, these kits are perfect. 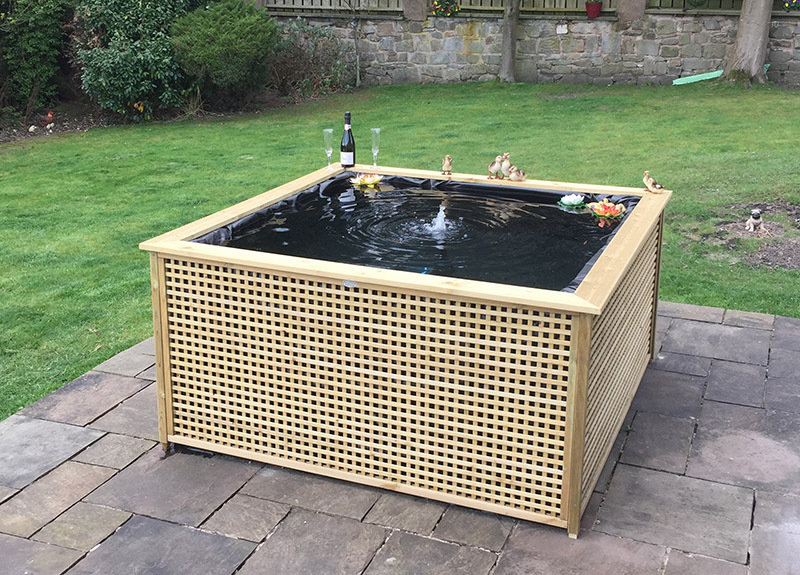 These unique above-ground ponds are delivered ready to use and enjoy. No need for excavation! Available in three sizes from 3680 litres (810 gallons) suitable for smaller fish such as Goldfish and Shubunkins, up to a giant 9820 litres (2160 gallons) suitable for Koi Carp. The ponds have a minimum depth of 90cm (3 feet) which helps your fish to survive cold winter weather. As pictured, these ponds come with a wooden lattice decorative surround. 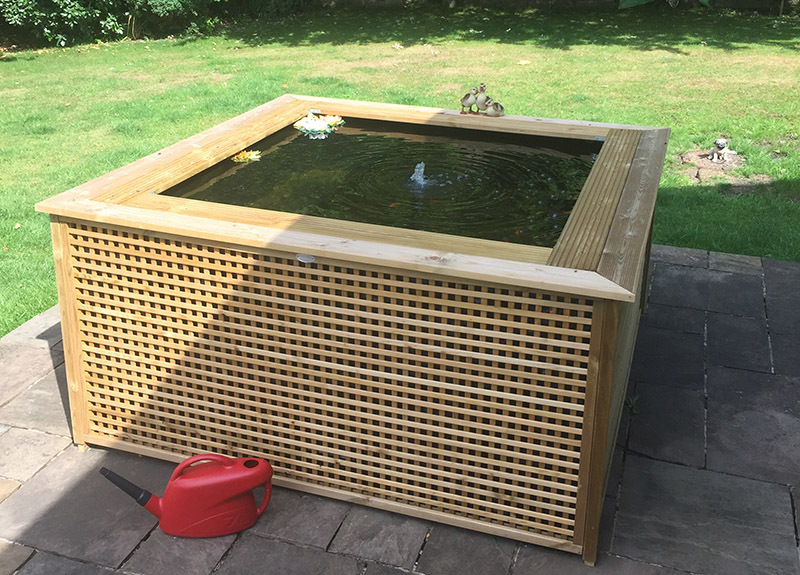 Or you can but a pond as a bare frame and liner, without the decorative panels and top timbers. The regular shape makes it easy to fit any style or material of screen that you like. 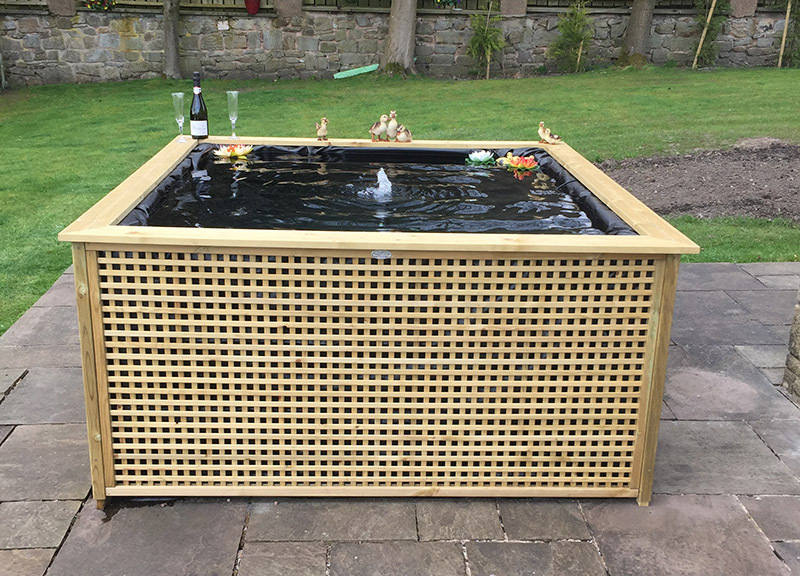 Any standard fence panel will fit, reed / cane on a roll, or timber decking. Whatever best suits your garden. 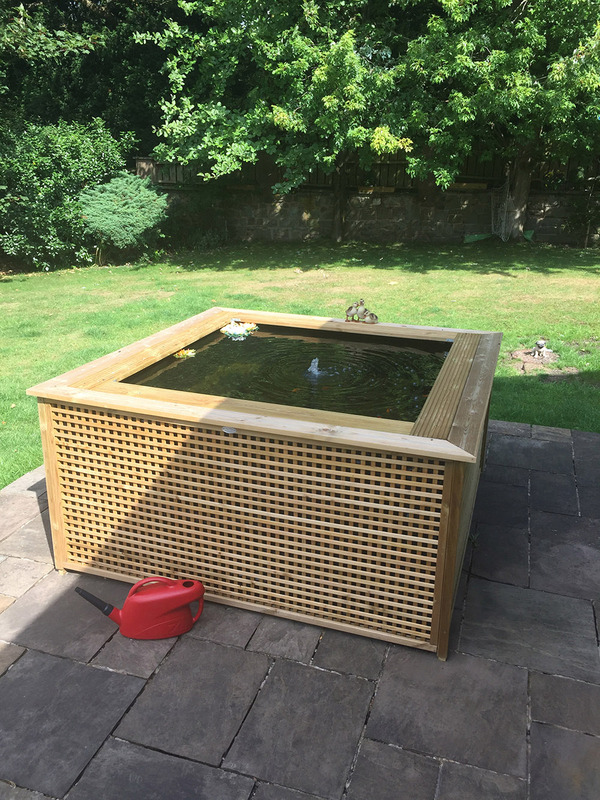 Delivered as an easy to assemble bolt-together steel frame and sides and liner – just fill it up! Just as easy to dismantle if you ever move house. You will need to purchase an all-in-one pond filter. We use the Hozelock range without problems. As a guide, the pond will have capacity of 1″ of fish per square foot of surface area. When filling your pond, new tap water should be treated to remove Chlorine. We recommend that you add fish slowly over several weeks, to allow the filter to mature. Suitable for Goldfish, Shubunkins and Sarasa Comets. Delivery to the mainland UK is included in the prices above. Standard build and delivery time is 2 weeks. (c) Raised Pond Kits 2019. Lower Newhey Mills, Two Bridges Road, Newhey, Rochdale, OL16 3SR.